Teddy had his follow-up MRI today. to discuss where to go from here. I want things NOW. Instant gratification. Bam. This experience is teaching me the importance of patience. where there's nothing else to do but try your best to trust. Earlier this afternoon, Teddy had an EEG test. to see if Teddy's having seizures. Lots of wires involved, so it might look scary, but it's not as bad as it looks. 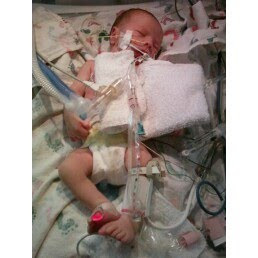 Teddy decided to pull out his ventilator tube. And he breathed on his own and did fine. But just to be safe, they put him on a CPAP machine. especially after having a tube in his mouth and down his throat. It was so good to see his cute little mouth again! Lab results showed that his blood oxygen levels are good. So they stopped the CPAP machine altogether. with just a little supplemental oxygen. Late last night Teddy started to show signs that he didn't feel well. He refused to nurse, and he wimpered while he slept. When awake, he arched his back, furrowed his brow and grimaced in pain. In the early morning, after 3-4 missed feedings and inconsolable fussiness, I decided to call the pediatrician to get an appointment first thing. Our doctor sent us to the emergency room for tests and monitoring. Blood work and x-rays were ran, and Teddy had a lumbar puncture. The initial results of the lumbar puncture were inconclusive, and we're currently waiting for the results, which should come back in 48 hours. While in the ER, Teddy also began to have issues breathing. This complication, in addition to his other symptoms, caused concern, and the next thing we knew, Teddy was being admitted to the Pediatric Intensive Care Unit @ St. John's, where he's being closely monitored. Right now, doctors think it's some sort of viral infection. Until a more definite diagnosis can be made, Teddy is receiving multiple antibiotics to fight off whatever he has. Teddy is also currently receiving breathing support from a ventilator and feeds through a feeding tube. The goal is for these machines to do all the work so that Teddy's little body can just do what it needs to do to get better. Since being intubated, Teddy's been resting more comfortably. No more of the crying out in pain for now. Thank you to everyone for all your thoughts and prayers.